The number of people with Alzheimer’s disease, the most common cause of dementia, is projected to increase to 13.8 million by 2050. As the disease progresses, individuals with dementia become more dependent upon others for assistance with daily activities. Ultimately, in advanced dementia, people with the disease need assistance with basic tasks, such as eating. To help educate about and help combat Alzheimer’s, ASA is pleased to make available information developed in 2017 by the experts at Research Triangle Institute International and funded by the Administration for Community Living in conjunction with the National Alzheimer's and Dementia Resource Center (NADRC). Presented here is a Generations supplement, numerous web seminars, and a description of a program which will be presented during the 2018 Aging in America Conference. Description: This session draws on the perspectives and experiences of current and former grantees that have attempted to reach out to minority and rural populations. Grantees will present specific strategies and lessons learned in reaching out to and working with underserved populations in their communities. 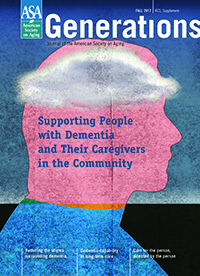 The supplement focuses on efforts underway to establish dementia-capable home and community-based service systems, and to develop effective, evidence-based services for people with Alzheimer’s disease and related dementias and their caregivers. The content features research and writing by dementia experts at RTI International, as well as many others well-known in the field of dementia research and advocacy. This content paves the way for service providers, families, and caregivers to provide person-centered, evidence-based, effective home- and community-based service systems for people with dementia and their caregivers. This supplement to Generations was funded by the Administration for Community Living (ACL), at the U.S. Department of Health and Human Services, in conjunction with the National Alzheimer’s and Dementia Resource Center, which is funded by the ACL and staffed by RTI International. In this webinar series, the Administration for Community Living’s National Alzheimer’s and Dementia Resource Center has partnered with ASA. This webinar series will address various issues related to Alzheimer’s disease and dementia. Free CEUs are available for up to 60 days after the live event. Advance Planning for People with Dementia: Legal Services Voucher Program in Delaware and New Consumer Planning Guides (recorded August 8, 2017). Building Dementia Capable Communities: An Orange County, NC Case Study (recorded July 19, 2017). Using BRFSS Data from the Cognitive Decline and Caregiver Modules for Action (recorded June 20, 2017). Providing Safe and Effective Nutrition for People with Dementia (recorded May 16, 2017). Methods and Techniques for Early Screening for Dementia for People with Intellectual and Developmental Disabilities (recorded March 7, 2017). Lewy Body Dementia: The Importance of Comprehensive Care and Support (recorded February 15, 2017). Cultural Awareness in Dementia Care (recorded January 17, 2017).